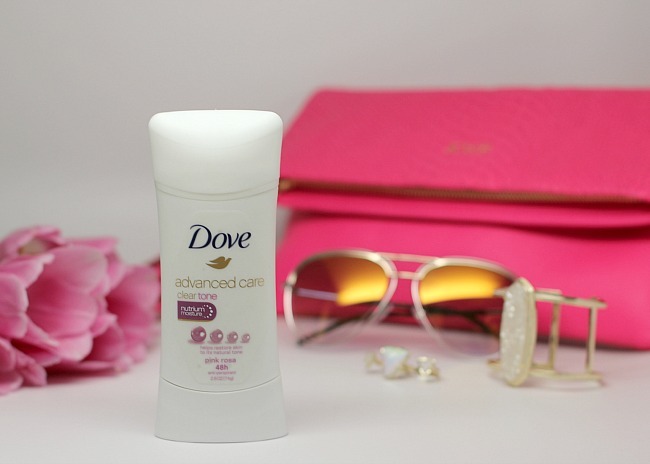 i am so excited to be partnering with Dove to bring you some of my favorite spring updates. with every seasonal change i like to take a look at my wardrobe and revamp some of the items. for instance, in spring i am looking for brighter colors, crisp whites and gold accent pieces. in addition to updating my wardrobe i also like to update my makeup and personal care. perfumes that are a favorite during the winter are switched out from more floral scents during the summer. while my preference for deodorant brands doesn't change (naturally it is Dove) i do like to update my scent to something floral. but really though, when you find a deodorant that offers 48-hours of odor and wetness protection, plus the added skin care benefits of a NutriumMoisture formula you wouldn't be switching from Dove Advanced Care Antiperspirant either! the formula leaves your underarms feeling soft and smooth and coming from this beauty blogger, i consider it an essential upgrade to your daily beauty routine. below is the outfit i selected to wear for the #rStheCon conference i attended last weekend. not only did i meet some amazing ladies including Jo-Lynn, Cindy and Alison, but i also had the opportunity to upgrade some accessories for the spring summer season along with some key beauty products. i consider them an #EssentialUpgrade. pictured below are some of those accessory upgrades. what products do you like to update for spring? please sound off in the comments below.